Did you know that bees’ lives are closely related to our health? Bees are responsible of the natural pollinisation of our fields and therefore improve the cultivation of fruits, vegetables and nuts. Unfortunately, more than ever, bees are threatened all over the world. Environmental changes, monoculture and pesticides used by many agricultural companies prevent bees’ colonies from perpetuate. It’s a vicious circle: more pesticides > less bees > less natural pollinisation > need of more artificial pollinisation > more pesticides. And, more pesticides = more toxicity for our health! Fortunately, there are green enterprises such as Alvéole. This Montreal-based company is the project of three friends which academic backgrounds had nothing to do with bees! Two of them studied music and the third one studied chemistry and English literature. However their common passion for apiculture and their environmental values guided them in the creation of Alvéole in 2012. 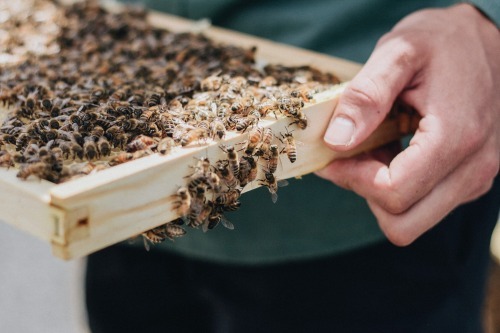 After working together as beekeepers in Manitoba, Alex, Declan and Etienne wanted to get involved in the ecological cause and educate people about environmental issues. Their beekeepers’ knowledge is their way to achieve their goals! Alvéole provides hive that can be installed in urban areas. Large cities, such as Montreal, Quebec, Toronto and Ottawa, now have legislation prohibiting the use of pesticides which help our bee friends expand. 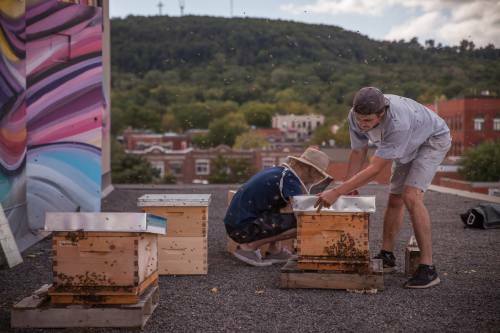 The company educates by giving classes in schools, workplaces and at home, and gets involved with the hives it offers; hive that you can personally install on your own roof. It’s a simple and underrated way to take care of the environment… and your tastebuds! Because, of course, you can harvest all the honey that is produced by your little bees. Double YES! And if some people can be reluctant, know that you can find many detailed information about the process and maintenance of hives online. Plus, the video capsules on the website are really interesting and easy to understand. 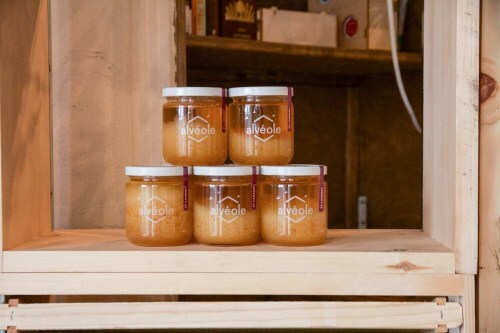 Recently, Alvéole that also owns about 50 hives of its own launched its urban honey products, available online. 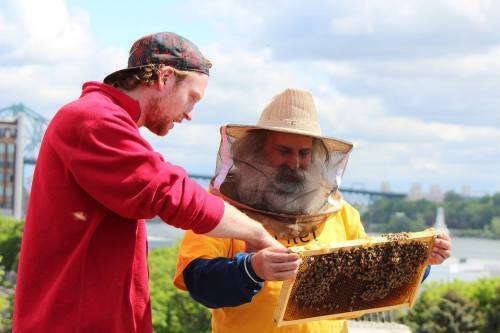 You can now taste honeys harvested on your city’s roofs! Sure, one bee’s work is pretty small but when all bees work together, they can do a lot!!! One hive contains approximately 50 000 bees and produces 10 to 15 kg of honey (sometimes more, during a particularly flourishing season). It’s the same for us, humans; by uniting our little daily actions, we can create a huge and positive impact on our planet. So, when do we install our hive? Learn more about this inspiring and passionate company here! And, did you know that? One hive contains 50 000 bees… so Alvéole is responsible of 45 millions of bees! The difference between bees and wasps? The first one is vegan, build its hive with bee wax rays and dies when she stings. The second is carnivore, lives in a paper hive and can sting more than once. It’s flowers that make the color and the taste of honeys. I.g. bees from Westmount harvest linden’s pollen which has a taste close to mint… Therefore the honey taste a bit like mint! Yum! Otherwise, how can help bees? Thank you Alvéole, especially to Jade Carier-Saucier, Sales and Marketing Director, for your generous answers and precious time!